Set on the third floor in an ideal borough location, this three bedroom flat boasts stylish accommodation including an open-plan reception room, a modern kitchen and three lovely double bedrooms. 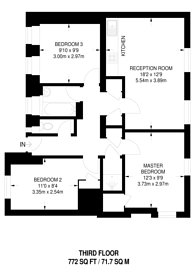 The property is ideally located on Long Lane just moments from Borough Underground Station. Borough Market is also close by for a vibrant array of amenities.